Working with front and back post stitches is a simple and fun way of adding texture to our work! 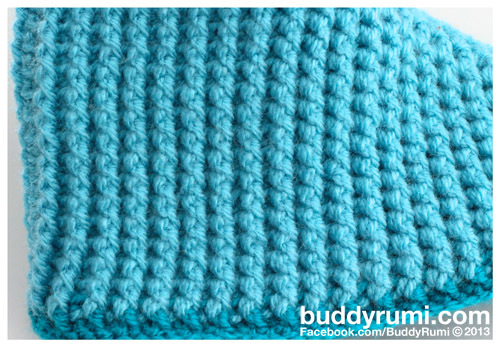 This technique can be used with the majority of all crochet stitches. Front post stitches pull the stitches to the front. 1. Because we are working with a half double crochet, chain 2 and yarn over. 2. Insert the hook into the space between the posts of the first and second stitch from the front to the back of the work. 3. Make the hook came out on the next space to the right. 5. Complete the half double crochet by yarning over and pulling the yarn through all the loops on the hook. 6. One row completely worked in front post double crochet. The top of the half double crochet of the previous row was pushed to the back. Back post stitches push the stitches to the back of the work. 2. Insert the hook into the space between the posts of the first and second stitch from the back to the front of the work. 3. Insert the hook from the front to the back into the next space to the right. 6. One row completely worked in back post double crochet. The top of the half double crochet of the previous row was pushed to the front and can be seen on the front of the work. This effect is accomplished by alternating between the front and back post crochet in the same row. The fact that the front and back post stitches raise and recede is more obvious when worked in this manner. When working the same type of post stitches (always back post stitches or always front post stitches) in all rows we get a striped effect on alternating rows on both sides of the work. When alternating between front and back post stitches in each row we get a striped effect on all rows but just on one side, the back is smooth.